With over 40 top brands, offers like low prices, free shipping*, same day shipping, real-time inventory, media rich shopping - eFaucets has a high conversion rate. eFaucets was a 2007 BizRate "Circle of Excellence" award winner. We have PowerReviews, BillMeLater, Google Checkout, Paypal and eBillMe. 97% of what we sell is in-stock and ready to ship the same day. If there is no A/C then answer is yes. Can a furnace be installed upside down? Yes, you can. More info in Chapter #25 of my Ductwork Installation Guide book. You can get all info you need on this page. Learn how to do that in the Chapter #45 of my Ductwork Installation Guide book. Nothing put a filter at the furnace. Are basements warmer than other parts of the house? Can a humidifier be hook up to downflow furnace? Can basement heat vents be on floor near cold air return? Yes, but better stay away from it. It’s always does, even if it’s oversized. Can electric outlets be put in cold air returns? Yes, but you have to run wires in a "Greenfield". Can I add a cold air return to a room? Of course honey, of course! Can I find pictures on how to install ductwork? Yes, you can: on my “Installation in Pictures” page or below. Can I install an HVAC register in the garage of my house? Can I put an exhaust fan in the basement with a gas furnace? Can I split a 6 inch duct into two 4 inch ducts for in line exhaust fan? Can you put in ductwork yourself? You should run combination of the smoke and B-vent pipes. And you can buy them on the right. 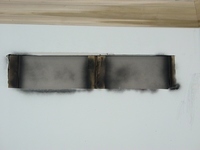 Can you seal an oil furnace exhaust vent with tape to prevent leaks? Can you vent a bath fan into the HVAC ductwork? Look, if you have only one bath fan in your house you must do it, because if you do it, you will always know if this bathroom is occupied or not and this will save you a trip! Do I need a fresh air intake in my basement? Of course you need it and I can help you to install it! Do I need the plenum or can I transition from the furnace to the main trunk? Yes, you need a plenum and transition. Do you have to remove an old attic furnace to install a new one? No, leave it there. Believe me you are going to feel twice warmer then! 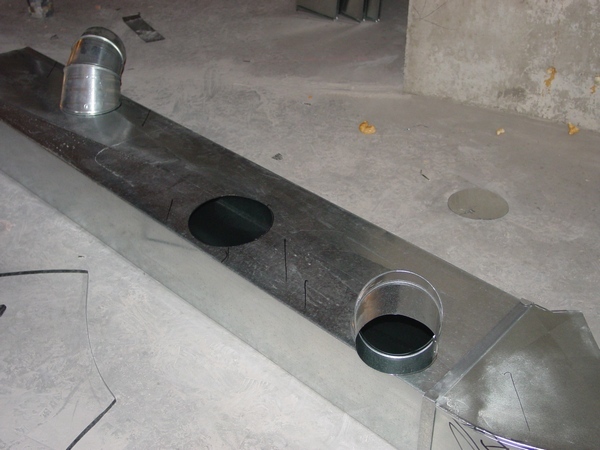 Do your own metal ductwork? No, I do not. However, ductwork that is installed in my home - yes I do! Does condensation line run when using heat? Yes, if you have a condensing furnace and/or humidifier. Does finished attic need a return register? Does the fan on the outside a/c unit spin right away or is there a delay? Does the heat in my attic effect air conditioning ducts that run through it? Gas builds up in my furnace then make a big bang sound is it still safe? How do I add ducts to my furnace? At first, buy my Ductwork Installation Guide book. How do you close hole in duct work? Use a sheet metal patch. How do you install ductwork? Mostly silently, sometimes with some WTF words. How do you properly measure ductwork installations? Use a tape measure. Do you need a tape measure? Get one on the right. How does air return run from second floor to basement? How does HVAC run duct from basement to attic? How far does exhaust duct have to be from supply duct gas fuel appliances? How many cold air returns do I require in my basement? Well, it is your basement boss – how many you require that many you install! How many ducks can I have with a 14“trunk line? How many ducks? As many as you want! But wait a minute, are you a drake? How many hours install new PVC flue side wall? It depends on how good you will follow my step-by-step explanations. How many cold air returns in house? In my house 15, how many in yours? How oval stacks reduce the air flow? Resistance of 6” oval stack is equal of resistance of 5” round pipe. How to cut ductwork offset? The best way to cut ductwork for offset it’s before you put ductwork together. How to do a cold air return in finished basement? It’s easy and very simple! Just go on this page of my website (or below) and get the answer! 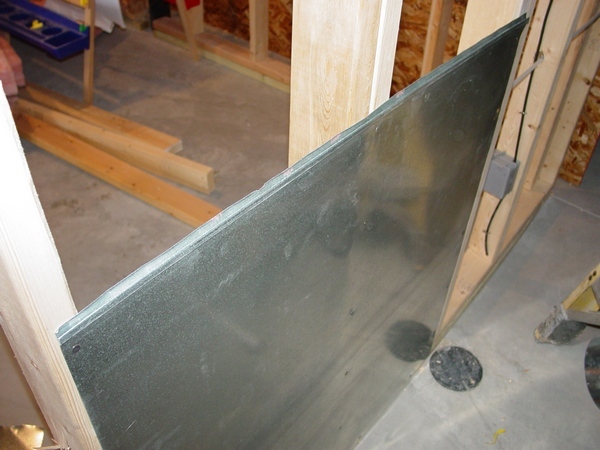 This page gives a description on the installation of the cold air return on the wall which is separating the mechanical room from the rest of the finished basement. On this page, you can see pictures of all necessary tools and materials and pictures of the system elements installed. There are 18 pictures on this page. All installation is divided into six steps that represents the entire project in the making. Well, at first drop all the ductwork down to the floor, jump and dance on it until it is flat, throw it in the dumpster. How to find out if cold air return is working? Just put a piece of paper on it. How to fire stop in a cold air return? A cold air return must remain open. How to fix a furnace starving for air? You should add some cold air returns and/or increase a cold air duct. 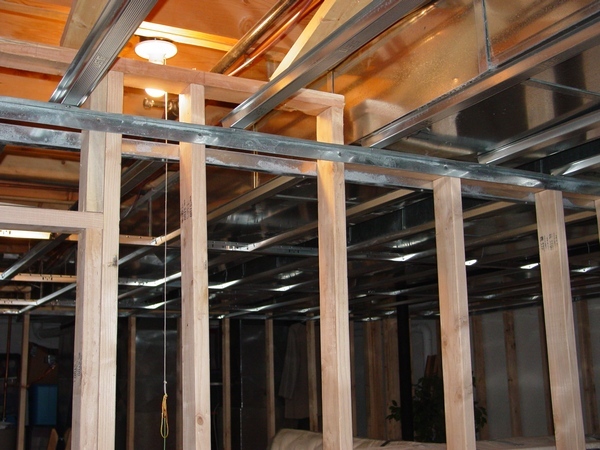 How to hook up ductwork to your heat pump in your basement? Hook up ductwork to my heat pump in my basement! Are you crazy? Leave my basement alone! How to install a gas furnace? Please visit a Furnace Book page or below. How to install a heating duct in basement? I have several paid pages on my website dedicated to this issue! For very, very low price you can get step-by- step explanations. How to install air register? Just screw it down to the register box and meanwhile use a torpedo level. Do not have one? Buy it on the right. How to install air registers? I have a chapter in my Ductwork Installation Guide book dedicated to this issue, or below. How to install duct risers? The same way you install the other ducts. How to install furnace in attic? I have a chapter in my Ductwork Installation Guide book dedicated to this issue. But I would suggest you to avoid this type of installation by any means! How to install new burner in old furnace? For this one it would be better to hire a pro. How to install the ductwork for a furnace humidifier? Oh, man it is very easy just send me some pictures of your furnace and humidifier and I’ll explain what to do! How to isolate vibration in hot air heating ducts? They don’t suppose to vibrate in the first place! How to make a furnace plenum? 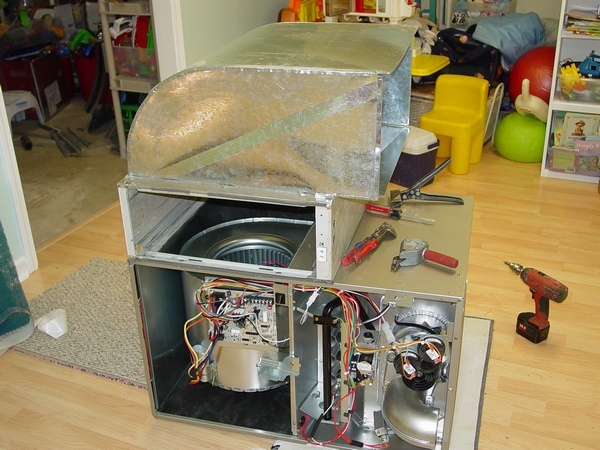 You can’t make a furnace plenum, but why do you need it anyway? How to ruin an air conditioner unit? This is an easy one! Grab a sledge hammer and beat it up till it flat. How to seal plenum to furnace? Just screw it down to furnace. No sealant required. How to train ductwork in Bangladesh? Dude, I have no freaking idea! How to use cool air from basement? It doesn’t work, but you can give it a try, just open the end cap on the return duct. Get more info on this page. I'd like to move the floor vent in my dining room to the wall, any major issues with doing that? No. Learn how to do it on this page or below. If I cover the cold air return in my ceiling, will my back rooms get warm? Are you kidding me, how could I know? If I off the a/c in summer, any problem occurs? No, you just going to be sweaty and smelly like a mouse, that’s all. Yes, it can drive you crazy! Is it code to have a fresh air intake? Is it difficult to install ductwork? For me? Piece of cake! Is it normal for air to be sucked in through condensate drain hole in air handler? No, there should be a condensate trap installed. Is it possible to receive radio broadcast through furnace ducts? That’s for sure! You even can watch TV! It's just depends on what you are smoking. Is the furnace supposed to make a loud noise when going off? Is there DVD training on duct installation? There are two DVDs available, but I saw both trial versions and I would not recommend you to use it as a training course. Is there flex heating duct installation tips? There is an installation manual in every flex duct box. Buy one on the right and learn how to install. I've been told by an AC contractor that I need an EZ Trap to be able to clean out clogs in the condensate drain line myself. I went to install it into the existing drain line and there is not enough space between the port and the lines where the coolant come in. They won't budge, so I need to relocate to another drain port. Does it matter which port I use? The port right next to the existing drain line would fit the EZ Trap if it is functionally the same as the one with the existing drain. That Freon line is soft copper and easy to bend and unless you are a klutz you should not kink it. You don't want to use that other port as it is higher than the lower one and the water level in the coil will go up. It is actually a overflow port where you can have a extra drain attached in case the lower one plugs up. Rarely used but it is there. As long as it is lower than the existing drain it should work. The air handler should be level from left to right and then it will work. Use the furthest away to the right port as it is lowest. That plastic overflow/drip pan usually is drained outside as well. Otherwise it could fill up and overflow. Yours looks like it has the pipe going nowhere. If you cannot drain it then I would put in a water detector alarm aka water bug alarm/sensor. You can get some that tie into the house alarm that you can buy on the right. Need to extend an HVAC return trunk an additional 32". What's the correct way to do this? It's an odd size of 8 x 20 with a spot welded cap at the end. It’s needed to maximize additional air return. Most ducts are connected using "S" locks and "Drives. The S locks seal and stabilize the horizontal edge, the drives are vertical locks that slide on tracks at the ends of each piece of duct to draw it together and seal the duct, then folded over to keep them from sliding off. If the verticals don’t have the tracks folded over to allow the drive to be slid on, measure that piece of duct and have a new one made up along with the extension. Bend the ends up, grab the drive with a pair of channelock and hammer it off. It should slide off. Should cold air returns be high or low in rooms? Yes, but better high and low. Should the duct takeoffs come off the sides of the supply plenum or the end and top? From the top and sides. The wall is an outside wall; would the sill plate interfere with the ability to connect to the duct work in the basement below? What are the symptoms of bad duct installation? Please visit my Wall of Shame page. What do I use to connect the return from the enclosed stud cavity to the main return? What does a ductwork installer do? Well, an average ductwork installer one hour a day is smoking, one hour a day is spending in a Porta John, one hour a day is taking lunch and coffee brakes, one hour a day is talking on his and company phones, a half hour a day looking for his tools and materials and only four hours a day is actually working. But because he is listening the same radio station every day at least ten hours a day he is very busy singing those songs and as a result he doesn’t have enough time to pay attention what the f..k he is doing! What does a HVAC sheet metal duct installer do? You are going to be surprised man: working, just working! 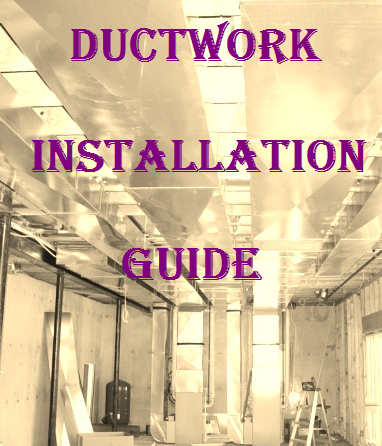 If you need more information purchase my Ductwork Installation Guide book. What happens if you block furnace intake with picture? This is not good, if of course it is a furnace intake of your mother-in-law! What if there is no cold air return in finished basement? What is needed for a ducted installation? 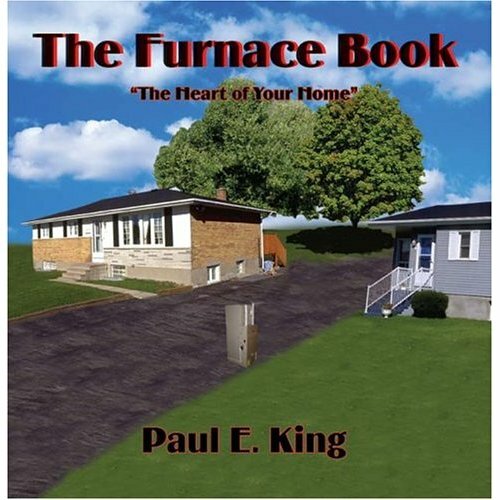 House, furnace, ductwork and my Ductwork Installation Guide book! What is the easiest ductwork to install? The easiest ductwork to install is insulated and un-insulated flex. What is the proper way to attach a flex duct to a register box? (Tie wrap, silver duct tape, mastic). Insulated flex ducts should be attached to the floor/ceiling boots using zip ties. And you can buy them on the right. What is the tapping or popping sound in my interior and exterior walls? Where you're butting two pieces together you definitely need a metal sleeve in there. You can buy this piece on the right. When to install a cold air return? Well, better in the morning, never after a few beers in the afternoon! Where I can find ductwork problem solutions? Where I can find free online tips for installation 95% furnace pipes? Free? I can explain but not for free! Where I can find free tips to install ductwork? By the way these courses aren't for free either, but even in the very short introductory versions they made so many mistakes that I would not recommend you to buy it at all, unless you want to learn how not to install ductwork properly! Where I can find sheet metal duct riser installation book? C'mon man you do not need the freaking book, you need only one page (or below) and it's here on my website. Where is the best point to attach the return to the system? At the cold air return duct. Where should cold air return be located in the basement in Alberta? In the same place it is located in any basement in Canada. Where to install a cold air return in a basement room? 8" off the floor in the interior wall. Which is more quite for noise flex or tin duct? Why after finishing basement cold air return not working? Why are cold air returns high on the wall? This one is a very interesting question! Why do ants get into motors & air conditioners? Because you did not put on the “No Trespassing” sign! Buy one on the right. Why do I have noisy cold air return? Most likely cold air return is undersized. You can easily add another one or increase size of the existing one. Let me know if you would like do it by yourself. Why does my duct work make noise with the heat on? It’s because HVAC techs weren’t experienced or educated enough. But I can help you to resolve your issue! Why does my duct work make noise? Well, pay $9.17 and I’ll help you to find out! Why furnace doesn't turn on until I tap the gray box? I do not know, but grab a sledge hammer and resolve this issue once and for all! Why is my basement so cold? Why do you think that you can find an answer to this question on the web? Ask it on this page and we will discuss your issue! Why is there a screw on the vent pipe coming out of my furnace? There suppose to be not only one screw, but three for every connection. Why there is a scratching noise in ductwork? Dude, let that cat out! I currently have a furnace running off natural gas which vents through the roof using PVC. Would it be possible to join a condensing tankless water heater which vents with PVC down stream about 10-15 ft and use a common exhaust? 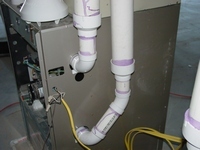 Most can be run out a wall, but I think you can do it, but then you have to increase the pipe size, install a 45* wye and another one on the water heater pipe to drain out the rain water and condensate generated in the furnace exhaust.